It’s finally summer, the season when everyone get busy in packing their backpacks to go outside for fun activities while on the other hand pests try to get inside of your home. Summer is actually the season of pests. Pests activities get increased on this season and this is mostly because of the temperature rise in the summer affect the behaviour and development of many common pests like cockroaches, flies, mosquitoes, bees, lizards, bedbugs, rats, etc. And to get rid of these nasty pests one should hire professional Pest Control Company in Delhi/NCR. Hiring pest control professional is one of the best and easiest ways to get rid of pests but, not everyone prefer hiring pest control service provider because of the chemicals that they use to kill and remove pests. If you want to keep pests away from your home then, you have to follow the do’ and don’ts of pest control so that you will not require to get pest control services. Here we are providing you some do’s and don’ts that you should practice to keep the bugs out from your home and have a pest-free home this summer. Block their entry: – The first thing that you need to do is to look for the spaces or holes that are helping pests to enter in your home. So, look out for those holes or gaps (even the minor ones). Check your door, windows or holes in walls or ceiling, etc. and repair if you find any. Keep your kitchen clean: – You know that your kitchen is the place that invites most of the pests like cockroaches, flies, rats, etc. So, you should always keep your kitchen clean. Do not keep your dirty dishes for long time in your sink, clean the kitchen shelve as food crumbs can attract pests, do not put the dirty wet dish towels, etc. as this can also invite pests. Use pesticides: – One of the best ways to keep pests away from your home is to use pesticides or insecticides. Always read and follow the pesticide label instructions. Try to use the ready-to-use products, which require no mixing. Get rid of standing/still water: – You know that standing or still water invites pests, commonly flies and mosquitoes – one of the most dangerous pests in the world. Standing water are a great invitation for mosquitoes to start their family and it is easy to miss standing water so, walk regularly in and around your property to check for it. Eat your fruits and veggies: – Do not let your fruits and veggies overly ripe on your counter because this can invite flies. And you know that getting rid of flies can be a challenging task. So, better your keep the fruits in refrigerator or you can eat them. Maintain your yard: – Maintaining your yard is very much important to keep the pests away. The overgrown buses or grass is perfect for pests and their nests. So, you should cut and trim the grasses to keep your yard maintain and avoid pest infestation. Leave the dirty dishes in the sink: – Dirty dishes can be a big fat invitation for the pests like cockroaches and flies. So, you should not keep your dishes for long time in the sink in fact, you should immediately wash after using them. Let trash in trash bins accumulate: – We often forget to empty the trash bins for two days or more but, you shouldn’t do this. The combination of trashes in your trash bin evoke smelly odor and this invite pests. Do not forget to close the bin’s lid and if possible then, also keep it sanitized well. Ignore the gaps or holes in window or doors: – You should not ignore even the minor gaps in your window frames or doors as this can be the entry gate for the pests to come into your house. So, make repair if you find any holes or gaps from the pests are coming. Leave food out in the open: – Do not leave your food open in your kitchen or anywhere in your home. If you have leftover foods then, seal it in a container and put it in the refrigerator so that the ants won’t crawl towards your foods. Use outdoor chemicals indoor: – Don’t get confused with outdoor and indoor pesticides as this can be harmful for your health. As many outdoor pesticides are intended to be used only for outdoors and can be very dangerous for indoor use. Forget to call pest control professionals: – While using the other tricks and technique to keep pest away do not forget to call your pest control professionals. Pest control technicians know how to deal with the pests and keep them away from your home. So, you should contact an experienced and professional pest control Delhi to get rid of pests in this summer season. All these tips are very easy and simple. You just need to follow each and every thing properly that is mentioned above. 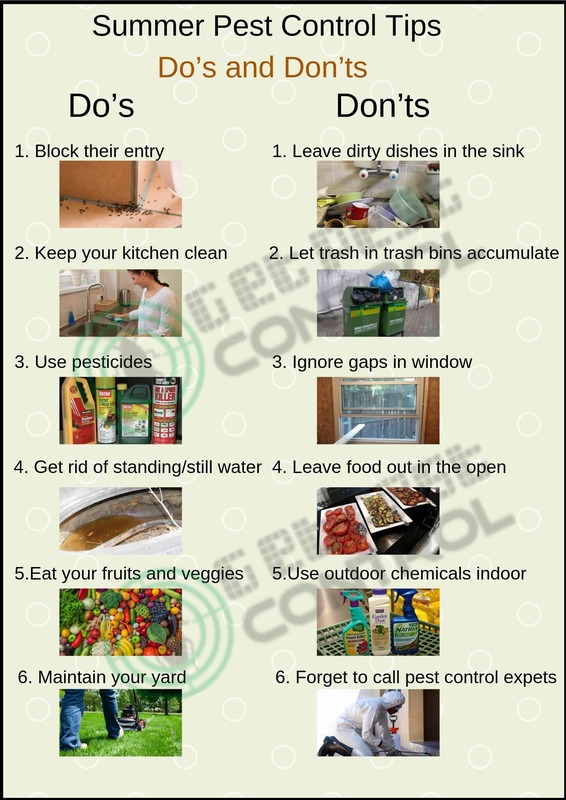 Hope these tips will help you to prevent pest infestation in and around your home. And if you will still face the same problem then, you can contact the best Pest management company in Delhi/NCR to get rid of pests.